Syrian official sources, the Syrian Observatory for Human Rights with its local sources, all agreed it was a coalition attack. 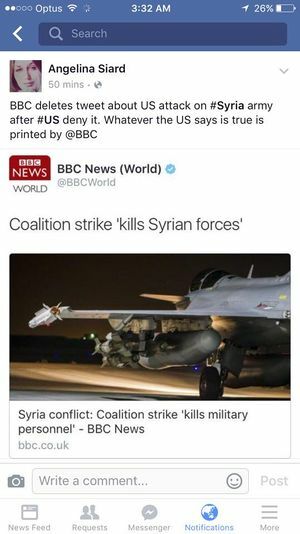 But the US and allies instantly denied the allegation, claiming to hit only targets 55 kilometers to the southeast of the base, and then claims were lodged by an unnamed U.S. official that it was in fact a Russian aircraft that carried out the attack, presumably in error, a claim so far received with tentative credence by the mainstream media. At right is a visual comparison of alleged attack directions, per Syrian army witnesses and sources (in red) compared to the area of the Saeqa base strike (target #2) and acknowledged U.S. coalition strikes at about the same time (white area). The Syrian story is that four coalition jets first attacked sites near al-Bukamal at the Iraq border. One pair of jets then turned and attacked the Saeqa base, flying from the east, shortly before 8 pm local time. One or both pairs of attacking jets then continued north hit targets in ISIS-held Shadadi. The coalition claims it made 4 strikes in the Deir Ezzour area that night, but all were to ISIS-held oil sites, and none were to Syrian military, nor any people or vehicles (later, a couple of civilians killed in Deir Ezzour that night were reported). They says none of their strikes were closer to the base than the white area, 55 km southeast of Ayash. 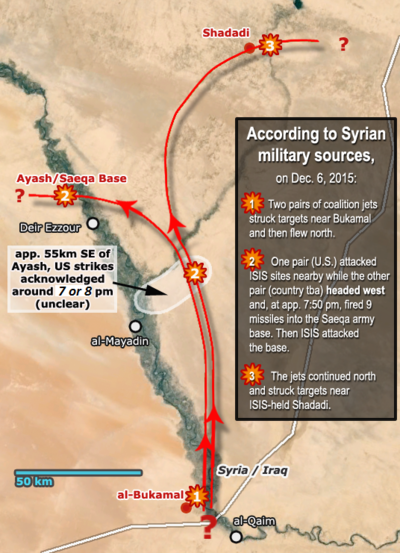 As this graphic illustrates, they acknowledge airstrikes that evening just a bit further back along the described attack flight path. Whoever attacked the base also flew over that patch of ground. However, anonymous officials also claim their strike was about an hour before the actual base attack by Rusian forces; Russian long-range bombers came in secretly an hour later (9pm, in either Syria or Iraq time, unclear) flying from Russia through Iran and Iraq. Once there, they hit Bukamal, then the Saeqa base, (or flew over it "within one minute of the explosion that killed the Syrian troops"). They presumably made this attack by mistake, officials suggest. “the coordination committees of the Syrian Revolution [also] confirmed the deaths and injuries caused by the bombing of coalition forces that targeted Al Sa’eka camp of the Assad regime.” And Daesh (Islamic State) also claimed that Coalition planes bombed Assad forces shortly after hitting Islamic State positions. Our correspondents in Deir e-Zor observed three planes carrying out the bombing, which occurred on the outskirts of the military base, hitting one of its barracks. 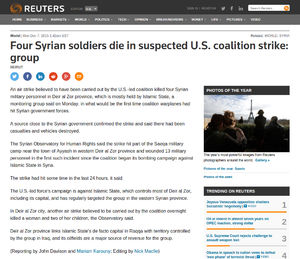 Most pro-regime news sources have reported that three soldiers were killed and others injured. This is the information that has been verified 100 percent so far. ... The targets were a barracks and ammunition depots. (correspondent) "In my opinion, this airstrike was a mistake by the coalition; since the start of their operations in Syria, their planes have never bombed any regime positions before. There is another theory that says the base is four kilometers away from any IS-controlled area, so how could it be a mistake? The picture still isn’t 100 percent clear." With a grain of salt, we could consider Syrian Perspective claim that the coalition attack was called in by ISIS forces, via Turkish intermediaries, to support their already-running attack on the base. As the ISIS main force was seen taking position across the Euphrates at a ford where the river’s level was low enough to permit four-wheel vehicles to cross, albeit with some difficulty, SAA spotters noticed the presence of many rubber dinghies and other small vessels useable for crossing a body of water. The SAA opened fire as soon as the trucks started to collect. SAA-MI heard chatter on terrorist telephone demanding some intervention to prevent a slaughter of their ranks, and, abra-cadabra, the U.S. sent in bombers to target the artillery laying waste to the ISIS rodents. A US-led coalition air strike on an army camp in Syria kills three soldiers, the Syrian government says, condemning the act of "flagrant aggression". US-led coalition airstrike on SAA position in Deir Ezzor (Photos) - AlManarTV, December 7, 2015 (original) Photos of serious destruction within the base - this would be quite an error. In Syria, coalition military forces conducted nine strikes using attack, fighter, and remotely piloted aircraft. ... Near Dayr Ar Zawr, four strikes struck four ISIL oil well-heads. The consensus among the Syrian Arab Army soldiers is that the warplane was flying west towards the village of ‘Ayyash before 9 missiles struck their positions. According to the Shaytat Tribesmen, the tribes of Abukamaal (eastern Deir Ezzor) reported coalition airstrikes above their city just a few minutes (before) they struck ‘Ayyash. Following the attack on ‘Ayyash in Deir Ezzor’s northern countryside, the U.S. led Coalition warplane struck the ISIS stronghold of Al-Shadadi in southern Al-Hasakah before completing their mission. The Syrian government has said three of its soldiers have been killed in a US-led coalition air strike, but the coalition has denied responsibility. UPDATE: 4:23 a.m. EST -- The U.S.-led coalition, which was suspected to have killed four Syrian soldiers in an airstrike in the western Deir ez-Zor province, has denied any involvement in the attack, Al Jazeera reported on Monday. Note: Syria claims the attack was around 7:50 PM, or about an hour before the alleged Russian presence and about the same time as the acknowledged US presence. However, Syria's given time was local (GMT +2) and the official may have been using Iraq time (GMT +3). A senior U.S. official said radar tracked a dozen Russian TU-22 bombers that left Mozdok, Russia, traveled over the Caspian Sea, across portions of Iran and Iraq, and launched airstrikes in Raqqa, Deir el-Zour and Al Bukamal, Syria. Radar shows Russian bombers making seven passes over the city of Deir el-Zour dropping munitions, the official said, adding that one of the TU-22s made a pass over the area of the army camp within one minute of the explosion that killed the Syrian troops. Overall, the Russian bombers launched strikes in four locations around Deir el-Zour. The U.S. officials spoke on condition of anonymity because they weren't authorized to discuss the matter publicly. A senior United States official later attributed any deaths and any damage to the Syrian base to what he called “a screw-up” by the Russians ... “We’ve got a radar track showing a Backfire bomber flying directly over the town that the Syrians named a few minutes before the first claims that we killed some Syrian troops,” the American official said, speaking on the condition of anonymity to discuss operational details. It's not clear how the radar track revealed the exact model of aircraft, or if they learned that some other way. The video shows a MS-3A fuze used in Soviet-made 100 mm anti-aircraft shells. This piece cannot be related to the airstrike. Destroying Syria to Create Sunnistan Mike Whitney, Counterpunch, December 9. Considers this attack alongside Turkey's moves in Mosul in context of neo-imperial designs to balkanize the Middle East. The Syrian Observatory for Human Rights (SOHR) also reported that a woman and two children were killed in a coalition air attack (the same or a different one, unclear) on the city of Deir Ezzour the night of December 6/7. Airwars.org lists this incident as "poorly reported. Contested." The VDC martyr's database records this partly, with a strange near-repeat the next day - 4 victims total, one provided name between them. Dec. 6, area not specified: Unidentifed 1 (adult female, "Married with a Child") notes: "with her daughter due to air forces shelling" (whose is not specified) - Unidentified 2 (child female) "with her mother due to air forces shelling"
SOHR December 6 "Der-Ezzor province: SOHR was informed that the IS executed a media activist by cutting him into 2 halves by 2 cars moving into opposite directions, in the charge of dealing with the U.S led coalition, in the city of Der-Ezzor." The answer is horrifically simple: to make an OFAB 250-270 explode you do not need to drop it from a jet – it can be done right on the ground. Any Qatar-linked terrorist group can drive it to a highly-populated area in Syria and stage a “merciless strike by the Russian aviation”. No doubt the a number of absolutely independent forensic experts would promptly conclude that this type of bomb is widely used by the Russian AF in Syria. This page was last edited on 6 October 2016, at 06:09.